WildBit Viewer is compact & fast image viewer with slide show and editor. Eye catching interface within blazing fast folder, file list and thumbnail viewer. Viewer includes also Image Info with Image EXIF meta data JPEG and TIFF support and IPTC (IIMV4) information (like PhotoShop file info) from JPEG and TIFF, Thumbview has changeable views, sorting and thumbnail predefined sizes for fast thumbnail size setting. Viewer also includes shell toolbar, you can drop your favorite folder there and use it as an organizer. Well it's been a few years. Wildbit works pretty much the same as it did 5 years ago. I'll never understand why this program consistently gets a 4 star rating. I've tried it and got rid of it a number of times. This viewer is getting better but it is still extraordinarily slow in generating its default-size thumbnails from large TIF files (100-600MB each). A directory of these large TIFs (50 or 100 or so) will bring WildBit Viewer to its knees. The worst aspect of this viewer is its terrible ergonomics, specifically one's inability to select a part of an image with the mouse and have that part instantly fill the screen (a la IrfanView or Hamrick's now-obsolete ViewPrint Pro but which does it to perfection*). Today, any serious photographer will have many huge TIFs on his PC, thus it's just a fact that he'll need to zoom in on sections of an image within a split-second, so Viewers that do not support such features are essentially useless. One really has to wonder if this developer actually uses WildBit Viewer outside his selection of small-size test images. * Produce a square or rectangle anywhere within the image with a mouse and immediately the mouse button is released the square/rectangle optimally fills the screen. Repeat this again or zoom in and out with the + & - keys. IrfanView is not quite as good ergonomically in that the selected square must be clicked before the image expands. It took me literally 1 minute after installing this slow, clunky, crappy thing to say out loud "Get this $#@!%& thing off my computer!" Except xNview Full is 15.5MB ... Unlike some I'll actually use a program before bothering to write a review. This is a decent Multi-App, with 4 separate Binaries plus the Profile switcher. Which lets you work with the Editor or Slideshow or Search separately (if desired) from the main viewer. Unfortunately, the search is slow the "Filters" don't make much sense (if they even work at all) and it doesn't support regex or pcre. [x] autoFit to window. Everytime you resize an image's window you need to manually reZoom. [-] The Create Icon is interesting and incomplete. If you've rezoomed a window (but not resized) The Create Icon, annoyingly, autoMaximizes the window again. Also it only lets you choose one icon size. 1) Font Settings for Thumb Details, and Font Settings for FullScreen Mode. 2A) Option to 1) use XPs thumbNail cache or other formats. 2B) Option to save WildBit's ThumbNail.dat cache to ApplicationData instead of per folder. Most of the windows can't be resized below a certain point, which is somewhat of an annoyance. Wildbit does NOT hose your system extension settings. Which is a major plus in my books. It will leave them completely alone if thats what you want. Looks promising if development continues. Faststone AIN'T the best freeware picture viewer. Neither is this, although this could very well be the best BLOATware picture viewer. They claim it's "compact" but the 7.2Mb setup filesize says something a little different. Getting better and a little more usable. The controls are a bit more intuitive. Still far from Faststone quality and usability. I can't help but wonder why developers feel they must include a browser (pictured above in the screen shot) when Windows already has a great one. Explorer already has thumbnails, browsing, sorting, comments, EXIF, sizing, and everything needed. A picture viewer only needs to have full screen viewing and light editing, and not duplicate the Explorer. Anyway, I've grudgingly upped my rating to 4 stars... 3.6 actually. Nice little viewer. I'm a solid Irfanview user but after ninjeratu I might have to try it to spite him. This is a nice free viewer. Since FastStone is widely acknowledged as best Freeware picture viewer, the following review compares it relative to FastStone. With a little tweaking, one can set WildBit up to somewhat emulate FS. It has pretty good setup options, but keyboard control is unconventional and not customizable. It's billed as "compact and fast", but it's considerably larger and slower. It has far fewer features, and the default configuration isn't nearly as useful or intuitive. Also the editor is weak, but I don't downgrade a viewer for lack of editing features. Compared to FS, I rate it a 3. If FS did not exist, I would rate it close to a 5. 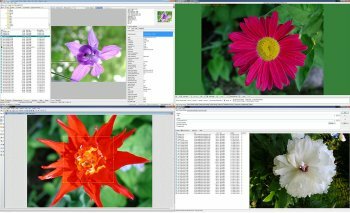 If I was a world class programmer, and wanted to create a popular Freeware program, an image viewer is the last thing I would tackle. That's because FS has such a solid lock on the genre. However, I encourage the Dev. to keep up the good work. It's not entirely impossible to catch up to FS. Very nice viewer, light and does what it's expected, thanks. Envy is a bad thing. Well ninjeratu, you and I will do not agree. I like this program because it's not bloated, well not yet anyways. Plus it does what it claims. Of course my main image viewing program is FastStone Image Viewer, this one is still very good. Very basic. How can this be version 5? Feels like a school programming exercise. Nothing anyone except the author would seriously use on a daily basis. Absolutely not worth 5/5, author and 50 of his friends probably voted for it. I give it 1 because the author is voting 5 for his own product. Lame.